After celebrating 5 years in Kenya in 2017, we are excited to celebrate our fifth anniversary of developing professionals who create social impact in Sao Paulo, Brazil in 2019. Part of our celebrations is a global conference on The Future of Impact Work, a reunion bringing together Social Innovation Management Fellows from over 20 different countries, and a team retreat for our global team spanning India, Kenya, and Brazil. The reason why we decided to make the main topic of this summit the Future of Impact Work is because we hear everyone speak about the Future of Work – from McKinsey to the Silicon Valley. What we found missing was a mainstream conversation on what these predicted future trends mean for social impact work and what capacities will be necessary to be developed in both, people and organizations, to not only react to but pro-actively shape future scenarios. We experience a strong trend of professionals from the private sector seeking to transition into careers with more meaning and impact – which shows us that social impact work no longer can be confined to its traditional sector and we have to talk about more broadly on how change can be generated across all sectors. This year’s World Economic Forum emphasized stronger than ever the importance of including social impact and change topics in the mainstream conversations – this, and the fact that our conference sold out within a week, speaks to how deeply these questions resonate with people across the board. At the Future of Impact Work conference, we will hear from thought leaders in the world of social innovation, such as Lisiane Lemos, founder of BAM (Blacks at Microsoft) who was recognized by Forbes as one of the Brazilians under 30 who made a difference in 2017, Claudia Valladares, Co-Founder and Director of Impact Hub Caracas, Sallyann Della Casa, founder of GLEAC promoting a breakthrough technology to develop and measure key soft skills for the future and Miguel da Hora, Amani Fellow and Global Shaper, (the youth network of the World Economic Forum). Partner organizations like Sense Lab, Amaphiko, and Update Politics are hosting explorations in various formats to ask questions ranging from the Future of Organizations, to Technology for change or the future of politics. Learn more about all our speakers and partners here. Following this conference, Amani Institute Social Innovation Management Fellows from all over the world will convene at Pauba Beach for a retreat to reflect on how their journeys in changemaking have evolved and how we can leverage the potential of this rapidly growing network. It’s crucial to have a tribe of like-minded people who can support and challenge us and our work when creating social impact. The reunion will give Fellows the opportunity to continue building collaborations globally, leveraging each other’s expertise and celebrate their work around the globe building a world beyond boundaries. .
As an organization, Amani Institute is constantly innovating and exploring new ways to create impact. 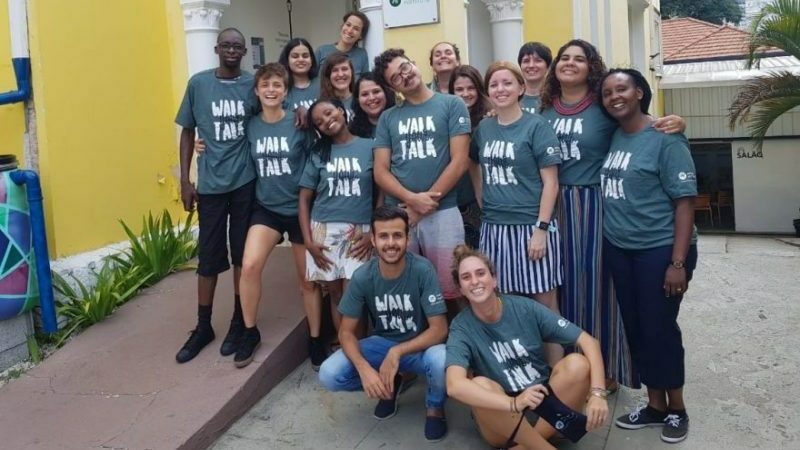 We will be bringing together our staff who hail from seven different countries in Brazil for a time of strategic planning and teambuilding to ensure we continue staying in tune with what employers demand from our Social Innovation Management Fellows as well as what organizations and universities need through our customized trainings. Thank you for being a part of our journey in Brazil as well as globally! We’d love for you to join the conversation by way of using the hashtag #impactwork and are excited to see what the next 5 years will bring!